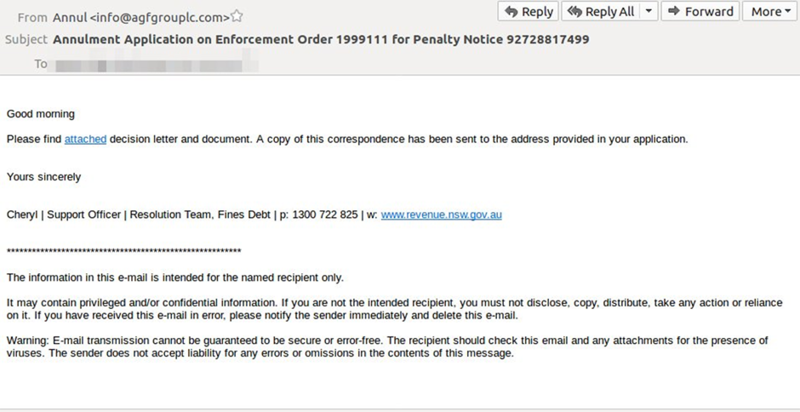 Scam emails pretending to be from Revenue NSW are targeting citizens. The emails feature a fake penalty notice, with an attachment that says it is an ‘annulment application’. Do not open the link. You could potentially corrupt and infect your computer with a virus. Revenue NSW emails end in 'revenue.nsw.gov.au'. If you receive an email with a different email address, just delete it. If you open it by accident, do not open any attachment. The scam email looks like this.